NRC estimates of technology effectiveness and cost are comparable to the agencies’ for most technologies. The report provides estimates of effectiveness and cost of the technologies considered by the agencies in developing the standards. After some culling and aggregation to facilitate display, I show in the figure below how the committee’s estimates of technology cost-effectiveness compare to the agencies’. 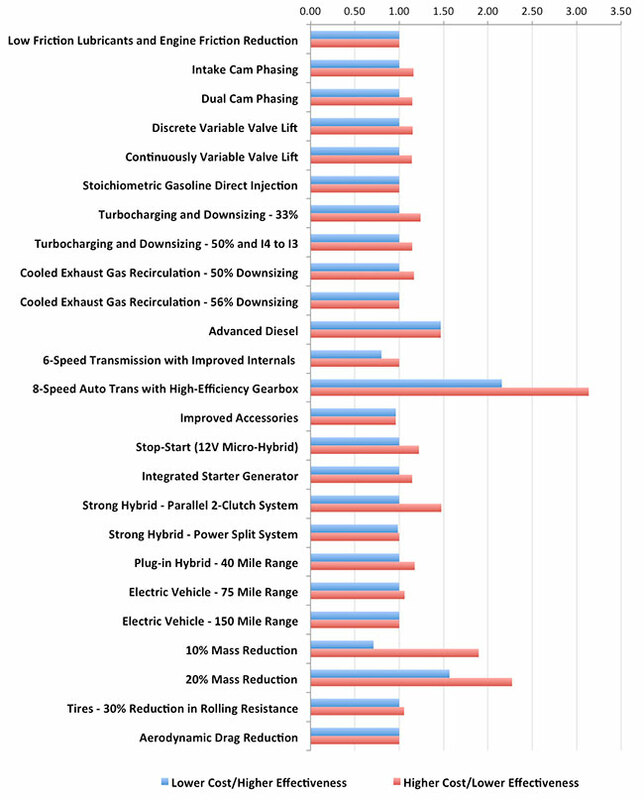 For each technology listed on the left, the length of a bar represents the ratio of committee estimates to agency estimates of cost per percent fuel consumption reduction. Committee members did not always agree amongst themselves on the best estimate, so the report provides two cost and/or two effectiveness values for many technologies. In the figure, the upper bars (blue) reflect the committee’s higher effectiveness and lower cost values, and the lower bars (red) reflect the committee’s lower effectiveness and higher cost values. The large number of bars with lengths close to 1 indicates substantial agreement with the agencies in most technology categories—though not all—with differences of under 20% for the most part. Mass reduction and transmissions stand out as areas of significant difference between the NRC and agency estimates. For transmissions, the committee found lower potential fuel savings than the agencies did in moving from 6-speed to 8-or-more-speed and shift optimization. Hence transmissions will be a key area to revisit during the midterm evaluation, and indeed EPA’s technical work for the review includes extensive benchmarking of vehicles with advanced transmissions and exploring what can be achieved through better shift logic. The committee found several other efficiency technologies that may help manufacturers improve fuel economy but that were not included in the agencies’ analysis, and hence do not appear in the figure above. Mass reduction cost projection is difficult. Reducing vehicle mass is widely viewed as a key strategy to improve fuel economy, and one to which manufacturers are already devoting substantial effort. The committee found that “the uncertainty surrounding the cost of mass reduction is particularly large.” At levels of mass reduction of 10% or below, the agencies’ cost estimate falls between the higher and lower NRC estimates. The lower estimate reflects the view that modest reductions in mass can be achieved at no cost. But for high levels of mass reduction, the committee projected costs much higher than the agencies’. The committee nonetheless predicted that manufacturers will reduce mass by 20% or more in large vehicles, motivated both by the need to improve fuel economy and by other benefits of reducing mass, such as the ability to increase towing and load capacities without any modifications to the power train. So, even if these higher costs were realized, part of the cost would have to be chalked up to meeting market demand for attributes other than fuel economy. A midsize car meets the 2025 fuel economy target with a conventional power train. The committee didn’t estimate the overall cost to comply with the standards; that would have required finding technology packages to reach the appropriate fuel economy target for every vehicle model sold and applying fleet averaging, off-cycle credits, advanced technology credits, and other flexibilities the program puts at manufacturers’ disposal. However, the report does show an illustrative technology pathway to meet the 2025 fuel economy target starting with a 2008 midsize car with an I4 engine and a footprint (area defined by the tires’ contact points with the ground) of 46.6 square feet. The vehicle met its 2025 target without transitioning to an electrified powertrain. The cost of the technologies to reach the target was $1,181, using the committee’s lower cost and higher effectiveness estimates, and $1,658 using its higher cost and lower effectiveness estimates. (This is direct cost, i.e., without retail markup.) By comparison, using the agencies’ technology effectiveness and cost numbers, it would cost $1,060 to reach the fuel economy target—not significantly different from the committee’s lower cost scenario. Even the committee’s higher cost estimate is much closer to the agency number than fuel economy skeptics’ estimates have been in the past. And most importantly, these estimates do not reflect the full range of efficiency technologies under development. Technology innovation can further reduce the cost of meeting 2025 targets. Thus far, fuel efficiency technologies in current vehicles are outperforming projections. Comparing some high-selling 2014 vehicles to their 2008 counterparts, the committee found that the agencies’ estimates of the effectiveness of fuel efficiency technologies were realized, and in some cases exceeded. For example, the package of technologies applied to a Honda Accord achieved a 24% greater reduction in fuel consumption from 2008 to 2014 than the agencies projected would result from that package. All in all, the NRC report provides strong evidence of the soundness of the CAFE standards out to 2025. The report highlights a few areas that will especially benefit from additional agency scrutiny in the midterm review. It also points to emerging technology opportunities that could reduce the cost of compliance with the 2025 standards, or alternatively allow vehicles to go beyond those standards to reach even higher fuel economy levels.